Laflamme, N., Préfontaine, P. and Rivest, S. (2016). Fluoro-Jade B Staining for Neuronal Cell Death. Bio-protocol 6(1): e1702. DOI: 10.21769/BioProtoc.1702. Fluoro-Jade is a fluorescent derivative used for histological staining of degenerating neurons. 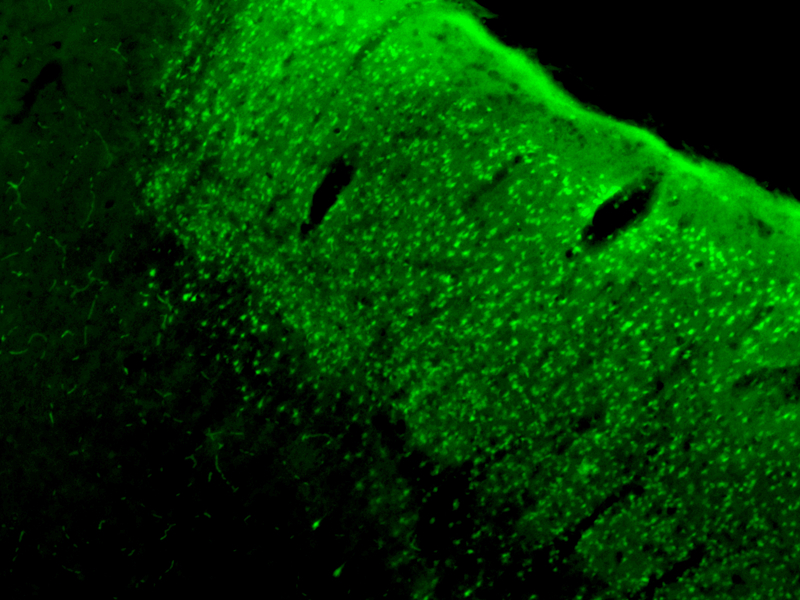 This technique is simple and sensitive enough to label distal dendrites, axons, axon terminals as well as neuronal bodies. Fluoro-Jade has excitation and emission peak of 480 and 525 nanometer respectively. It can be visualized using a fluorescein/FITC filter. Some reports have demonstrated that Fluoro-Jade can also be useful to detect glial cell death (Anderson et al., 2013; Damjanac et al., 2007). Note: Currently, it is “Thermo Fisher Scientific, Molecular ProbesTM, catalog number: D3571”. Mount tissue sections (20-35 μm cut on microtome or cryostat) on Superfrost plus slide and let the slide dry overnight under vacuum. 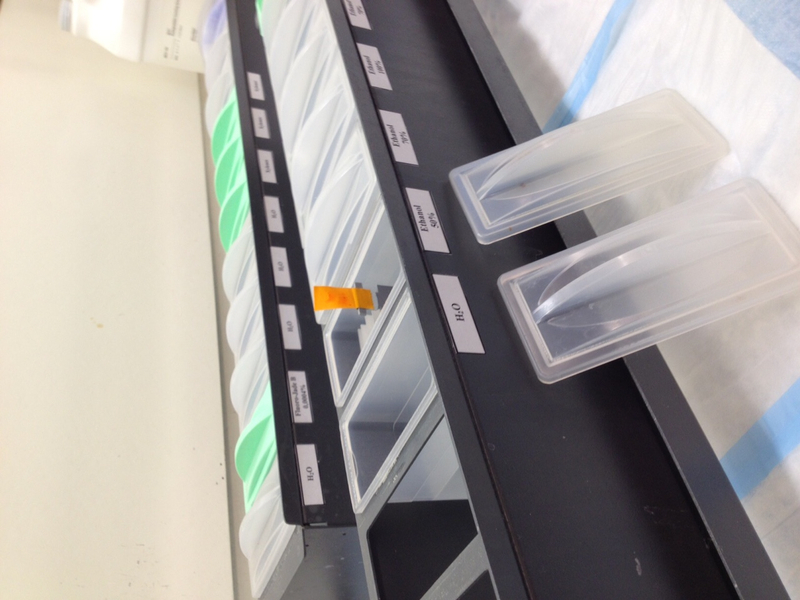 Fix the tissue on slide warmer 30 min at 60 °C and/or 20 min in paraformaldehyde 4%. Follow by 2 min in KPBS. Note: All the following steps are done at room temperature. Dehydrate in 50%-70%-100% Ethanol 2 min each. Rehydrate by going back in 70%-50% Ethanol and KPBS, 2 min each. Incubate in potassium permanganate 0.06% (dilute in water) 5 min at room temperature. Rinse in water 1 min. Incubate in Fluoro-Jade solution at room temperature for 10 min and gently shake on orbital shaker or by doing several dips during incubation (three dips of few seconds 3 times during incubation). Use opaque cup for the Fluoro-Jade incubation and keep the slide in shelters from light for the rest of the procedure. Note: Fluoro-Jade solution and potassium permanganate 0.06% must be prepared fresh. Follow by three rinses of 1 min each in water. Dry the slides overnight under vacuum at room temperature. Clear the slide in Xylene (3 x 2 min). Cover slip with DPX and dry 24-48 h under hood before microscope analysis. To ensure reproducibility between protocols, use the same method of tissue preparation. This protocol was adapted from Schmued et al. (1997). This work was supported by grants from the Canadian Institutes for Health Research (CIHR) and the Multiple Sclerosis Scientific Research Foundation of Canada. Anderson, K. J., Fugaccia, I. and Scheff, S. W. (2003). Fluoro-Jade B stains quiescent and reactive astrocytes in the rodent spinal cord. J Neurotrauma 20(11): 1223-1231. Damjanac, M., Rioux Bilan, A., Barrier, L., Pontcharraud, R., Anne, C., Hugon, J. and Page, G. (2007). Fluoro-Jade B staining as useful tool to identify activated microglia and astrocytes in a mouse transgenic model of Alzheimer's disease. Brain Res 1128(1): 40-49. Schmued, L. C., Albertson, C. and Slikker, W., Jr. (1997). Fluoro-Jade: a novel fluorochrome for the sensitive and reliable histochemical localization of neuronal degeneration. Brain Res 751(1): 37-46. How to cite: Laflamme, N., Préfontaine, P. and Rivest, S. (2016). Fluoro-Jade B Staining for Neuronal Cell Death. Bio-protocol 6(1): e1702. DOI: 10.21769/BioProtoc.1702. Yes, it happen sometime. Make sure your tissus are well perfuse with PFa4%-borax and cut at 25um max. If your tissus is too tick you will have higher background. You can also decrease a little the incubation time in the potassium permanganate (2-3min instead of 5). Big green background even in my wild-type brain. did twice but nothing changes.